Application softwares installed on your PDA are useful for daily work. But when there are too many unused applications and garbage that stuck into your RAM or storage, it could impact the performance significantly. Users may either experience system slow down and even whole system hang up eventually. If you are one of them, here could be a solution for you. Named as ClearTemp, it is a free and useful software utility to clean up unused garbage stored in your PDA with only a few simple clicks. Want to have a peace of mind during weekend without disturbance from boss or customer‘s call? This software tool may able to help you. 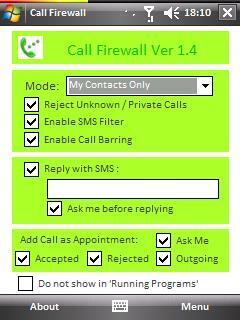 Known as Call Firewall + SMS Blocker Version 1.4, the utility will be able to filter out any annoyance calls on you Windows Mobile Smart Phone intentionally anywhere. TapRoot System, a leading smartphone software developer has just unveiled a new software based solution that is able to turn a mobile phone into a Wi-Fi access point, making a mobile hotspot a reality for cellular market. Known as WalkingHotSpot, it is targeted for those mobile internet users that would like to extend broadband access to other network devices anywhere on the move.